Summer Learnin’ Happened So Fast! Char-Leen Craner spent part of her summer as an Assistant Instructor for Inventors Inc. and Lego Robotics with Galileo Summer Quest. Check out what she learned along the way! I was an Assistant Instructor this summer with Galileo Learning. 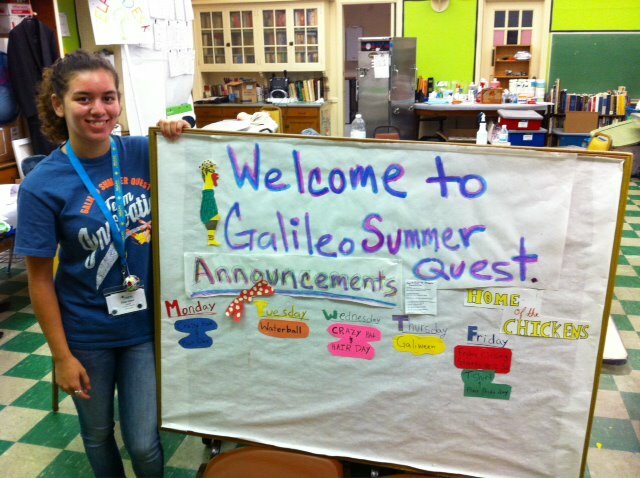 I worked at Galileo Summer Quest – a fun and innovative day camp for rising 5-8th graders – and had an amazing time! I heard about Galileo Learning through SRA last summer but was unable to participate due to other commitments. The interview process is pretty rigorous; you fill out an online application comprised of several essay questions, followed by a phone interview and then an interview at the home office. The overall culture and experience was well worth the lengthy interview process though. Specifically, as an Assistant Instructor, my job was to support the lead instructor in managing classroom organization and with facilitating curriculum. This internship taught me a lot about teaching and working with younger kids who come from different backgrounds and demographics from me. Before this job, I wanted to work with kids and was considering being a teacher. However, I have learned that being a teacher is a lot more than what I see as a student in the classroom. There’s the preparation, grading, cleaning and a whole lot more that goes into it. I have decided that I probably do not want to be working with kids in a teaching environment, which is a really good thing because I’m still doing some career searching. The only downside to my experience was the hiring process. Galileo is a 6-week camp, and if you aren’t one of the first people hired – that is if your hired after April – most likely you wont be able to work the entire 6 weeks. For instance, I was only offered three weeks, with the possibility of working more depending on camper enrollment. This was difficult for me because this left me in a position where I didn’t know what was happening with my expenses. It could be a tough decision for someone weighing other opportunities, especially if you do not know whether you’ll be working or not. On the flip side, the best thing about this internship, besides my own career epiphany, was working with my colleagues! They were extremely fun to be around, which made for a great environment for me to be working in. I am very happy to have worked with Galileo and may even consider returning for more fun next summer! This entry was posted in Internship/Career Development. Bookmark the permalink.